Interval Traing And Muscle Confusion And How Does It WORK? Interval Training or Muscle Confusion is a very important part of weight loss and muscle development. What is Muscle Confusion and Interval Traning you ask? A sure way to break the monotony of your daily workout routine is to incorporate interval training. These are short burst exercises that can last anywhere between 30 seconds to 3 minutes. "/>Almost anyone can incorporate interval training into their fitness routines. The beauty of it is that it can be done almost anywhere, a track, park, garage or right in the comfort of your own living room. It requires no special equipment and you can gradually increase your intervals as your fitness level improves. If you do have equipment at your home, interval training can be performed on almost any cardio machine, (treadmill, stair mill, stationary bike, elliptical trainer, etc). Breaking up your exercise routine with interval training not only boosts your fitness level, but it can help pass the time quickly and keep exercise boredom at bay. So if you are ready to step up your workout and challenge yourself a little more, interval training is a great way to start. It adds variety to your workout and you can work at your own pace. Remember, to avoid injury, start off slow and work from your personal fitness level. Also, its best before beginning any diet or fitness program to consult a physician Doing the same routine week after week will cause your weight loss to stall causing you to have less results. What you should do is add a wide variety of workouts or exercises that works the muscles from different angles. Also switch up you reps, number so sets and rest periods. There are hundreds of different exercises to choose from that you could incorporate safely into your old routine. This is not only good for you muscle growth, its also good in keeping you mentally fresh and motivatied. 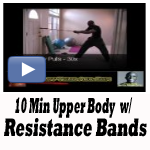 Here's Is Great Interval Routine I Do When I'm On The Road In My Hotel Using Resistance Bands.